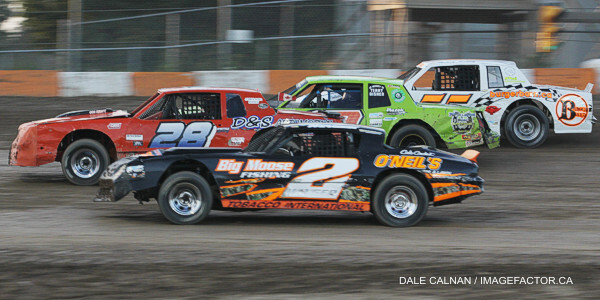 by Tommy Goudge (August 16, 2013) – 100 drivers signed in to race on Metal Works “SOS vs. Corr/Pak” night at Ohsweken Speedway on Friday night. Mikey Kruchka took a popular win in the Southern Ontario Sprints versus Corr/Pak Merchandising Sprint Cars feature, while Dave Silverthorn, Jr. got his first dirt track win in the Affordable Towing & Recovery Thunder Stocks feature, Jason Lungaro drove from last to first in the HRW Automotive Mini Stock feature, and Brady Longboat visited Klotz Canada Synthetic Lubricants Victory Lane after the Gale’s Auto Aftermarket Bombers feature. 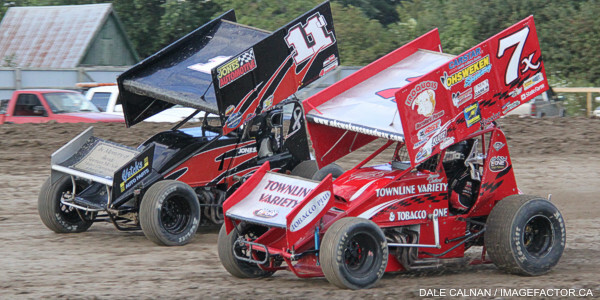 Dain Naida and Stan Zanchin were the front row starters for the 25 lap Sprint Car feature, but Chris Steele utilized the outside groove to take the lead before the first lap was complete. Steele fought off several advances from Naida, while Mikey Kruchka began to move steadily through the field from his 4th row starting spot. Engine trouble for Mitch Brown brought out a caution flag on lap 10, when the 3rd place driver in both the Corr/Pak and SOS championship chases laid down a big streak of oil. Steele still led Naida at this point, with Brown dropping out of the third spot, which was then inherited by Kruchka, followed by Jim Huppunen and Justin Barger. Huppunen was quick on the restart, and challenged Kruchka for third, but another caution flag fell for a spin by Mike Ferrell before the lap was complete. Kruchka got a better restart the second time, and moved around Naida for the second position on lap 12, then went to work tracking down Steele, who was still running the top groove while Kruchka rolled around the bottom. Kruchka made the eventual winning move on lap 16, and went on to take his second career Sprint Car feature win. Steele had to back off as he and Kruchka almost collided while passing a slower car, and then held on to the runner-up spot despite a late charge by Justin Barger, who settled for third, followed by Dain Naida, and Jim Huppunen. Heat races for the 33 car field were claimed by Shane Ross, Mikey Kruchka, Jared Zimbardi, and Stan Zanchin, while Jim Huppunen and Glenn Styres won the B-Mains, and Mikey Kruchka won the Nathan Ackland State Farm Insurance “Top Gun” Award for accruing the most passing points in heat race competition. Corr/Pak division points leader Jim Huppunen had to qualify from a B-Main, but made up for lost time in the feature by moving from 17th on the grid to finish 5th. Glenn Styres lost the oil filter on his car while leading the 4th heat race, which caused his #0 to go up in flames for the second week in a row. Styres drove from last to first in his B-Main, and then 18th to 8th in the feature. SOS points leader Chris Jones started 14th and finished 7th, finishing in front of his challengers for that championship in the process. The Corr/Pak Merchandising Sprint Cars will run their postponed B-Main and A-Feature from the July 19 rainout next Friday, August 23, along with their regularly scheduled event. Shaun Quinn and Brett Rodwell started on the front row for the 20 lap Thunder Stock feature, and Rodwell was the first of 6 different drivers to lead at least one lap. Trevor DeBoer led lap 3 before Mike Thorne took over at the front, but Thorne and Cory Turner made contact, with Thorne eventually dropping back. Turner took over the lead on lap 8, but found himself running side-by-side with Bryce Richardson for almost half the race, which allowed Dave Silverthorn, Jr. to sneak around both of them, and lead the last 4 laps of the race for his first ever dirt track feature win. 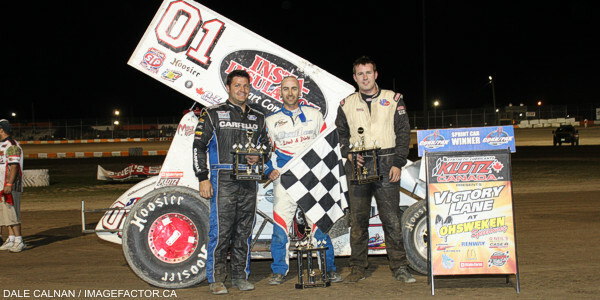 Richardson got the second spot, followed by Turner, Karl Sault, and Lee Winger. Heat races for the 29 car field were claimed by Terry Martin, Kevin Dawson, and Chris Dickie, while Brad Herron won the B-Main. Jade Pelletier and Mike Giberson started the 15 lap feature on the front row, but Brittani Myers quickly got to the front, followed closely by Jamie Goudge. Those two broke away from the pack early in the race, but the championship contenders were marching forward from their handicapped starting positions deeper in the field, and a lap 10 caution flag brought everyone back into contention. Points leader Davey Boughton eventually got to the lead and looked to have his 6th feature win of the season wrapped up until his right front tire went flat on the final lap. Jason Lungaro had started dead last, and was up to 2nd when Boughton’s tire went flat. Lungaro got by in turn 3 and took his first win of the season, while Boughton settled for the runner-up spot, followed by Jeremy May, Chase Hess, and Lucas Lubin. Heat races for the 23 car field were claimed by Brittani Myers, Chase Hess, and Laura Hughes. Brady Longboat started on the outside of the front row and led much of the 12 lap Bomber feature, but Jesse McDonald was close behind Longboat at the end. McDonald made contact with an infield implement tire and bounced up into Longboat’s back bumper near the end of the race, but Longboat carried on to get his 3rd feature win of the season. McDonald settled for second, followed by Dusty DeBoer, Wayde Thorne, and Valen Longboat. Heat races for the 15 car field were claimed by Brady Longboat and Dusty DeBoer. Gale’s Auto Aftermarket presents Brock Leonard Memorial Night at Ohsweken next Friday, August 23, featuring the Corr/Pak Merchandising Sprints with a full program along with their postponed B-Main and A-Feature from July 19, plus the Affordable Towing & Recovery Thunder Stocks “Brock Leonard Memorial 50”, the HRW Automotive Mini Stocks, and Gale’s Auto Aftermarket Bombers. Spectator gates open at 6:00pm, with racing starting at 7:30pm! 1. 3r Shane Ross (Thedford), 2. 10 Mitch Brown (Brantford), 3. 80 Chris Steele (Vineland), 4. 11j Chris Jones (Demorestville), 5. 14h Jim Huppunen (Fenwick), 6. 31 John Burbridge, Jr. (St. Williams), 7. 7x Jamie Collard (Burford), 8. 67 Chris Durand (Port Stanley), 9. 66 Frank Baranowski (Mount Hope). Time – 1:59.036. 1. 01 Mikey Kruchka (Hamilton), 2.  f37 Kyle Moffit (South Dayton, NY), 3. 07x Dain Naida (Tecumseh, MI), 4. 27h Tom Huppunen (Fenwick), 5. 30 Adam West (Ridgetown), 6. 84 Tyler Rand (Consecon), 7. 30g Steve Goldner (Aylmer), 8. 9 Jim Munsie (Pickering). Time – 2:00.655. 1. 35 Jared Zimbardi (Bradford, PA), 2. 5b Justin Barger (Montrose, NY), 3. 5 Keith Dempster (Alton), 4. 49 Todd Hoddick (Cheektowaga, NY), 5. 81 Derek Jonathan (Lewiston, NY), 6. 10c Bob Crawford (Sutton), 7. 2 Brad Lodge (Stouffville), 8. 15 Mike Ferrell (London). Time – 1:57.670. 1. 94 Stan Zanchin (Fort Erie), 2. 11 Jamie Turner (Caistor Centre), 3. 25 Warren Mahoney (Lefroy), 4. 5c Conor Mahoney (Waterdown), 5. 9nz Havard Daniels (Aukland, NZ), 6. 10j Jeremy Hughes (Burlington), 7. 01f Kyle Fraser (White Lake), DNF. 0 Glenn Styres (Ohsweken). No Time. 1. 14h Jim Huppunen, 2. 7x Jamie Collard, 3. 10c Bob Crawford, 4. 84 Tyler Rand, 5. 66 Frank Baranowski, 6. 15 Mike Ferrell, 7. 2 Brad Lodge, DNF. 10j Jeremy Hughes, DNS. 67 Chris Durand. Time – 1:56.618. 1. 0 Glenn Styres, 2. 30 Adam West, 3. 81 Derek Jonathan, 4. 9nz Havard Daniels, 5. 31 John Burbridge, Jr., 6. 30g Steve Goldner, 7. 9 Jim Munsie, 8. 01f Kyle Fraser. No Time. 1. 38 Terry Martin (Ohsweken), 2. 77 Brett Rodwell (Caledonia), 3. 23 Trevor DeBoer (Caledonia), 4. 119 Shaun Quinn (Caledonia), 5. 4 Dale Gyokery (Jarvis), 6. 17 Rob Disher (Grimsby), 7. 84rk Ryan Beagle (Vittoria), 8. 00 Robbie General (Ohsweken), 9. 93 Melissa Miller (Ohsweken), DQ. 911n Phil Nyssen (Burford). Time – 2:57.309. 1. 44 Kevin Dawson (Caledonia), 2. 55 Mike Thorne (Caledonia), 3. 31 Dave Bailey (Hagersville), 4. 19 Cory Turner (Caistor Centre), 5. 85b Ryan Dinning (Caledonia), 6. 81 Karl Sault (Dundas), 7. 2 Lee Winger (Caledonia), 8. 12 Brad Herron (Waterford), 9. 10 Jake Brown (Brantford), 10. 48 Mike Graham (Caledonia). No Time. 1. 1 Chris Dickie (Brantford), 2. 28 Jim Lampman (Caistor Centre), 3. 91 Ryan Turner (Caistor Centre), 4. 04 Wyatt Van Wart (Cambridge), 5. 25 Billy Bleich, Jr. (Port Robinson), 6. 9 Dave Silverthorn, Jr. (London), 7. 11r Bryce Richardson (Port Colborne), DNF. 85hg Glen Leinen (Hannon), DNF. 33 Jack Myers (Wainfleet). No Time. 1. 12 Brad Herron, 2. 84rk Ryan Beagle, 3. 2 Lee Winger, 4. 11r Bryce Richardson, 5. 10 Jake Brown, 6. 00 Robbie General, 7. 33 Jack Myers, 8. 93 Melissa Miller, 9. 911n Phil Nyssen, 10. 48 Mike Graham, 11. 85hg Glen Leinen. Time – 3:26.717. 1. 22 Brittani Myers (Hamilton), 2. 90 Chad Smelser (Dunnville), 3. 1 Kathi Dickie (Brantford), 4. 69 Rob Twitchett (Dundas), 5. 76 Jamie Goudge (London), 6. 05 Dave Goodacre (Brantford), 7. 11 Mike Giberson (Caledonia), 8. 84 Jade Pelletier (Wainfleet). 1. 7x Chase Hess (Ohsweken), 2. 81 Alex Schuts (Oakland), 3. 55 Rob Slater (Dundas), 4. 16 Jeremy May (Hamilton), 5. 66 Brandon Janssens (Woodstock), 6. 79 Steve Miller (Paris), 7. 21 Jonathan Ayrton (Hamilton), 8. 69e Dan Erskine (Caistor Centre). 1. 10 Laura Hughes (Puslinch), 2. 7 Jason Lungaro (Hamilton), 3. 53 Mark Verhuel (Dundas), 4. 18x Davey Boughton (Carlisle), 5. 265 Mike Evers (Caledonia), 6. 29 Lucas Lubin (Hamilton), DNF. 66x Jon Janssens (Woodstock). 1. 66 Brady Longboat (Ohsweken), 2. 43c Chad Foster (Hamilton), 3. 188 Paul Longboat (Ohsweken), 4. 6 Wayde Thorne (Waterford), 5. 42 Joe DeBoer (Hagersville), 6. 03d Dakota Potts (Waterford), 7. 32 Gillian Hils (Dundas). 1. 23 Dusty DeBoer (Hagersville), 2. 9 Tim DeBoer (Caledonia), 3. 28 Bobby Burgess (), 4. 88 Jesse McDonald (Caledonia), 5. 97 Max Chechalk (Hamilton), 6. 7L Valen Longboat (Ohsweken), 7. 707 Josh Shantz (Mannheim), 8. Adam Hallett (Cambridge).